Happy Diner closed, by all accounts, over the summer of 2017. I’ve left the review up for posterity. I’ve always felt that when I go to a Chinese restaurant I am missing something important about how to order. I don’t speak Mandarin so the special menu (or the beautiful back pages of a menu) for real Chinese people to order from are lost on me. Instead it seems like every Chinese restaurant is selling the same dishes and with a few notable exceptions – cue my inevitable mention of sadly-departed Reading institution Chi – the experience is always the same; great starters, more crispy duck than is strictly wise and then adequate mains, all served by incredibly polite staff who somehow make the experience feel a little like I’m eating in a library. 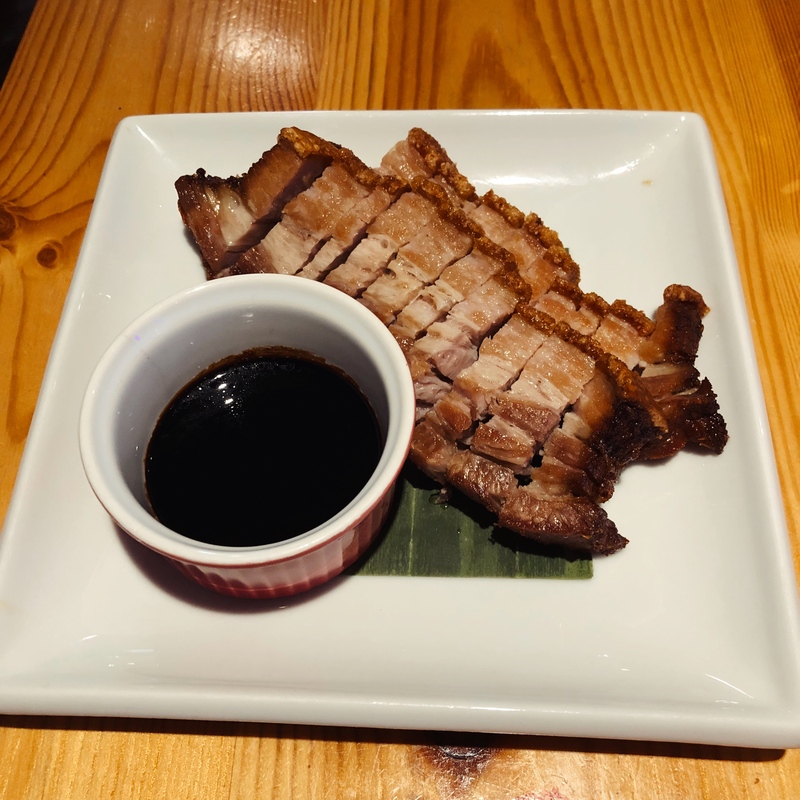 Since I started this blog I don’t think I’ve made any progress with Chinese food at all. And it’s not like I don’t know that Chinese food can be wonderful – I still have vivid food daydreams about a sizzling chicken dish I had in Chinatown, rich with a slick savoury sauce, bubbling in a stone pot also containing seemingly a hundred pungent garlic cloves – but here in the provinces we don’t seem to get anything like that. I know it might be my fault, watching food arrive at other tables and wondering “what have they ordered? 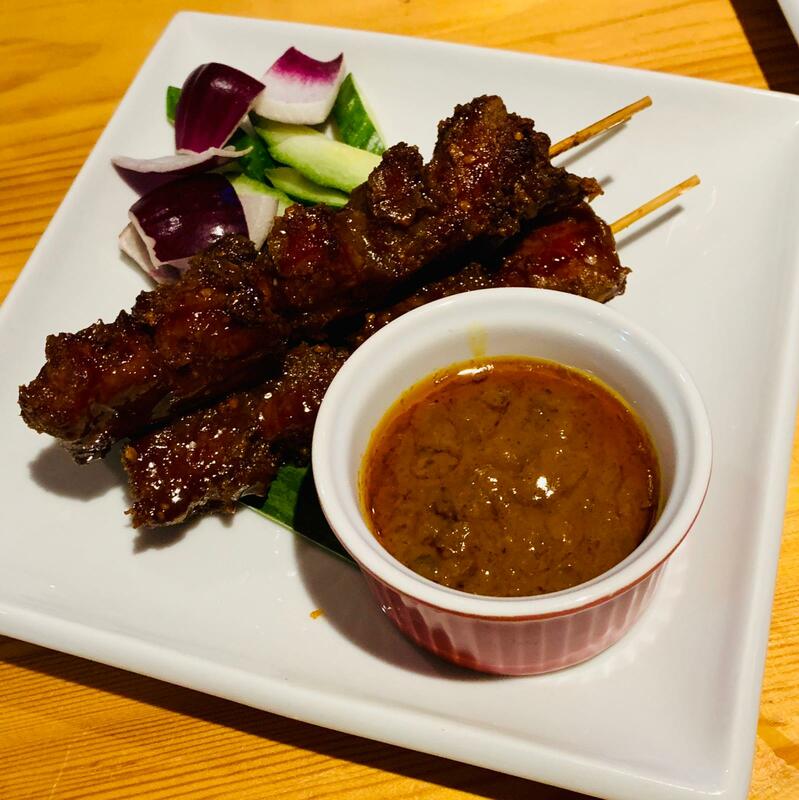 Have they picked better than me?” before returning to my prawn toasts, satay, disappointment. Stepping into Happy Diner on a school night didn’t give me the sense that this review was going to be the one to change all that. If anything, the large, chevron-shaped room felt more like a conference centre than a restaurant. There were the obligatory sofas at the front for folk collecting takeaways, there was a fish tank filled with beautiful shimmering koi and then there was a large, long room with Chinese murals (of varying quality) on the walls. The tables were heavily draped and the chairs were the padded metal-framed ones which always – along with excitable uncles and Come On bloody Eileen – remind me of wedding receptions. And yes, it was like eating in a library: only two or three other tables were occupied, all spread out in that big space. Presumably this was done to give people privacy, but it felt a little isolating to me. After polishing off the mandatory polystyrene prawn crackers with sweet chilli sauce I was even less convinced this was going to be The One. We started with a couple of dishes that, in retrospect, weren’t the most well-balanced. 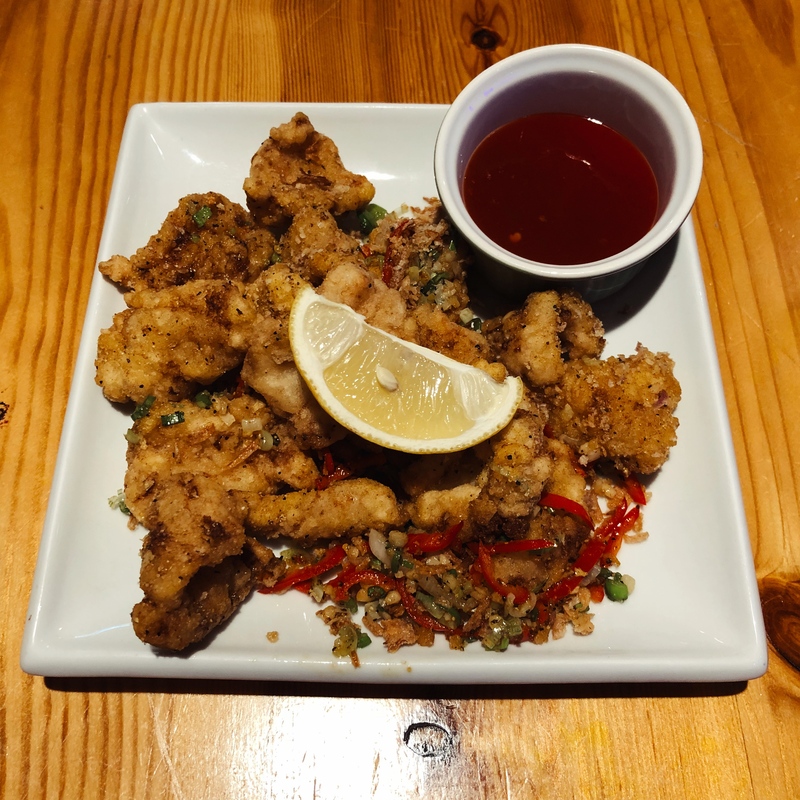 The “smoke dry spicy chicken happy diner style” resembled Chinese chicken nuggets; slivers of chicken, about the size of whitebait, that had been lightly dusted then fried. It was hard to detect any smokiness and they certainly weren’t dry – the paper doily (yes, a doily! How long is it since you’ve seen one of those?) they were served on was sheer with the amount of oil it had soaked up. So if they weren’t smoky and they weren’t dry, what were they? Mainly sugary: even the finely chopped green chilli on top tasted candied and sweet rather than adding the jolt it so badly needed. Oh, and huge – a pile so gigantic that we left close to half. Even then that meant we ate quite a lot. They were curiously addictive, but in the same way that Percy Pigs are. The other starter, salt and chilli squid, was similarly problematic. Done well this is one of the best things in the world, but Happy Diner’s version didn’t quite get there. The squid was nicely soft, the batter was light and again, the pile of squid was massive but, again, blandness was the order of the day. What didn’t help was that the pieces of squid themselves were equally gigantic – so big that I either had to pick up a bit and try to bite it (not the most delicate of operations) or pop a whole piece in and try not to choke or burn my tongue. Smaller, crispier bits of squid would have been lovely, but this was just a big fluffy cloud of frustration. The best bit was the mixture of the little crunchy salty bits of batter and the (hotter this time) chillies. It made me glad my companion had opted for cutlery, because I was never going to scoop up that delicious goodness with my amateurish chopstick skills. 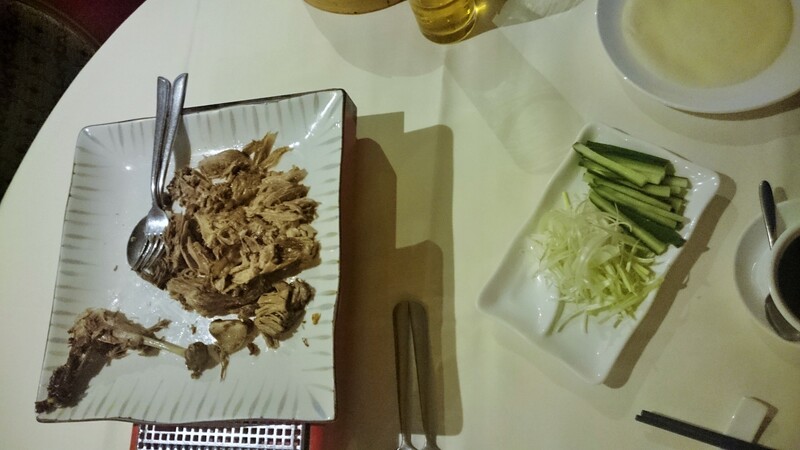 The next course – no surprises here – was the crispy duck. I knew this would be too much food, but I’m biologically programmed not to turn crispy duck down. I had a sinking feeling from the moment it turned up. You know that wonderful moment when the waiter crushes the duck under a spoon and starts to shred it? That beautiful cracking noise as the skin gives way and breaks? This was more of a dull squelch, and at that point I knew that this would be duck but it wouldn’t be crispy. Normally when the crispy duck arrives, I’m like a kid in a sweet shop (I want that bit! No, that bit! Oh, and that bit!) but here it was more of an effort to find pieces that would perfect my pancake. First world problems I know, but the whole thing about crispy duck is that it’s never, ever like this. There was definite eking required, in fact, to stretch this out to six pancakes, and the last one I had was just spring onions, cucumber and hoi sin (in the immortal words of Roy Walker, good but not right). The rest of the trimmings were much the same as in any Chinese restaurant but at the end of the course, instead of scooping up the delicious fragments with our fingers we were left with a sad and flabby pile of skin. 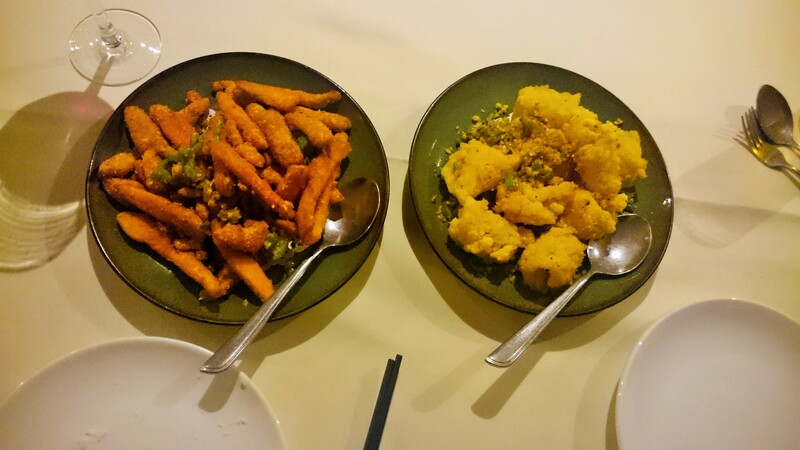 The main courses arrived similarly swiftly and didn’t lift things; again, it felt like perhaps we’d ordered the wrong things rather than the dishes we picked being actively bad. King prawns in black bean sauce was probably the best (least worst?) 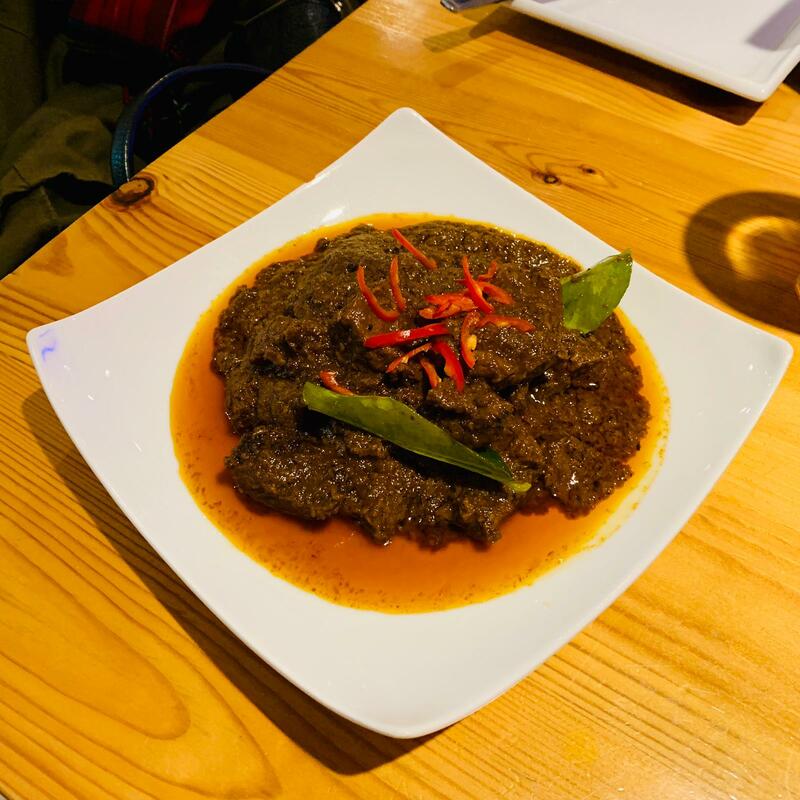 of the evening, with plenty of fat prawns in a watery sauce which tasted better than it looked with discernible black bean, a decent hit of garlic and lots of crisp squares of red and green pepper and big pieces of onion. If I’d had it on a Saturday night in front of Take Me Out I’d probably have been satisfied, but somehow here it still felt like it wasn’t quite good enough. I was hoping the other main would either take me back to my teenage years or show me exactly how a good Chinese restaurant really does sweet and sour chicken. It wasn’t quite the battered balls of my youth (and yes, I know how wrong that sounds) but it wasn’t much of an improvement on that either. The batter the chicken came in was soggy rather than crispy, the sauce was again thin and watery rather than coating the chicken (it wasn’t that indistinct, to be honest, from the stuff we were dipping our prawn crackers in not that long before). 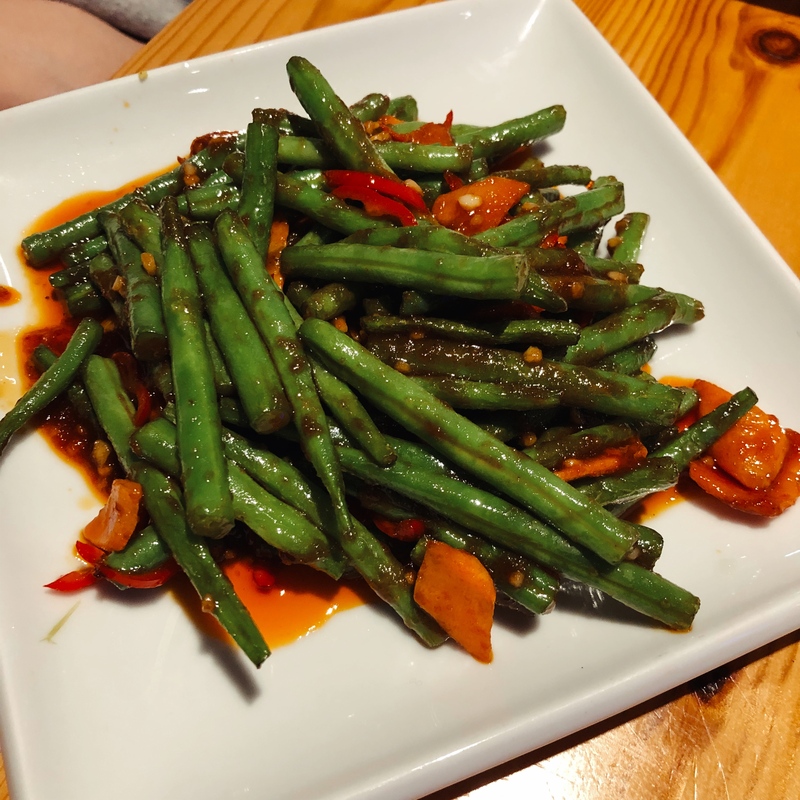 The vegetables in the sauce gave me a strong sense of déjà vu, too; crisp squares of red and green pepper and big pieces of onion (did a black cat just walk by?). Oh, and some pineapple, obviously. It made me miss Orient Express, which used to be next to Keegan’s bookshop, which used to be opposite what Shed used to be, and even writing that sentence makes me feel very old indeed and makes me realise how long it is since I’ve had lovely Chinese food in Reading. On the side we had plain noodles which, not beating about the bush here, tasted a bit odd. Sort of salty but not NaCl salty. I can’t even explain how they were wrong, but they just weren’t good. 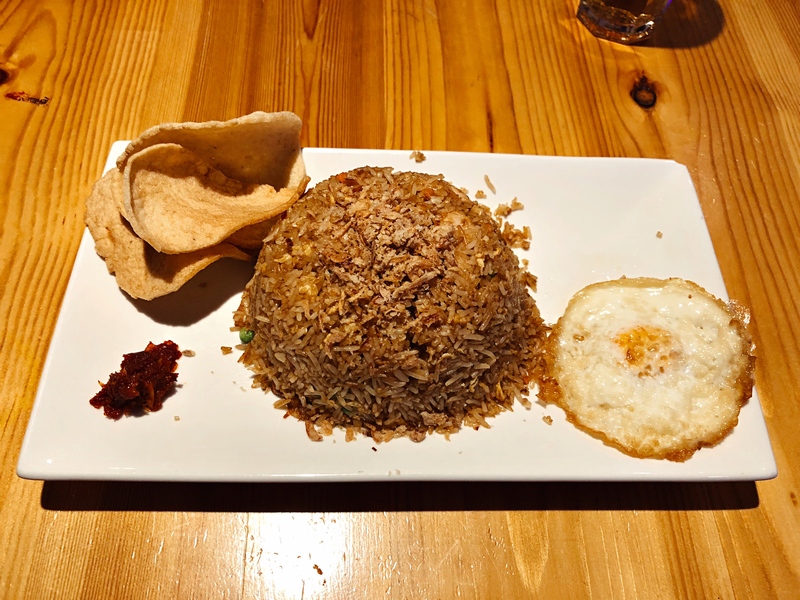 My fault, perhaps, for not going with the more traditional rice, but I’m just not a fan of plain white rice and it felt like overkill to order egg fried rice as well. 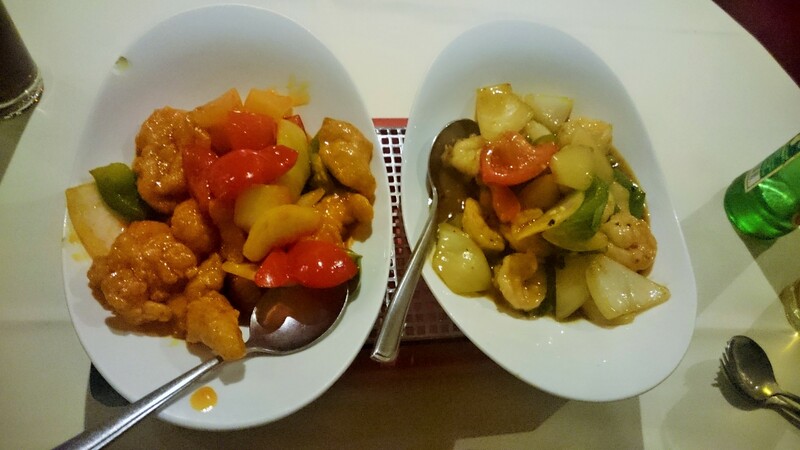 We left a lot of the main courses – this is of course traditional in Chinese restaurants, but it would have been nice to feel even a little regret at doing so. Drinks were a glass of house red wine (described simply as “Italian”) which was decent enough and a couple of bottles of Tsingtao. Service throughout was very polite, friendly, efficient and ever so slightly distant, much as I expected it to be. We were far too full for the dentist-bothering delights of dessert (toffee apple, anybody?) so we munched on the mint imperials that came with the bill – crumbly rather than hard, which made me irrationally happy – instead. The total was fifty-four pounds excluding service. We wished them a Happy New Year as we left and, not for the first time, I felt like a fraud being polite to someone when I hadn’t much enjoyed eating in their restaurant. So am I any the wiser? Probably not. I still feel like I don’t know what to order, I still don’t have the courage to venture into the more esoteric reaches of the menu (perhaps I’d take more risks if I hadn’t read David Sedaris’ entertaining essay on the perils of eating in China: I’d quote some, but a single sentence of his would show all of this up). Is it my fault that I didn’t like Happy Diner? Quite possibly; you can probably make your own mind up about that. But be that as it may, there’s one question it all comes down to, the main question really when you review a restaurant: would I go back? I stepped out of the door with Mya Lacarte on my right, I strolled down Prospect Street past Kyrenia with its lights glowing, a laughing table of eight in the window and Ihor leaning on the bar and I thought no, I can’t see when I ever would.